There is no doubt that the Sequeiras are seafood lovers, save for one little Sequeira who won’t have anything to do with fish. Well, most fish. For some reason after he turned 3 he decided to give up all kinds of fish – we still haven’t figured out why. It is a task to get him to eat fish and in the past couple of years I just decided I wouldn’t force him. Perhaps some dish he ate had a tinge of fishy smell to it and that could be the reason why he gave it up altogether. But recently I decided that it was time to reintroduce the food which was once his favourite. I started by making fish fingers at home (recipe here) with Basa or Cream Dory. Boneless fish is easier to work with but I was limited to just this fish. It gets really tedious to make an extra something for him on the days we have fish. In the recent months our kitchen saw a decline of seafood being cooked because who had the time to slave over cooking different types of food, clicking, blogging, minding the extra naughty almost 2 year old and making that extra dish to appease the little god? 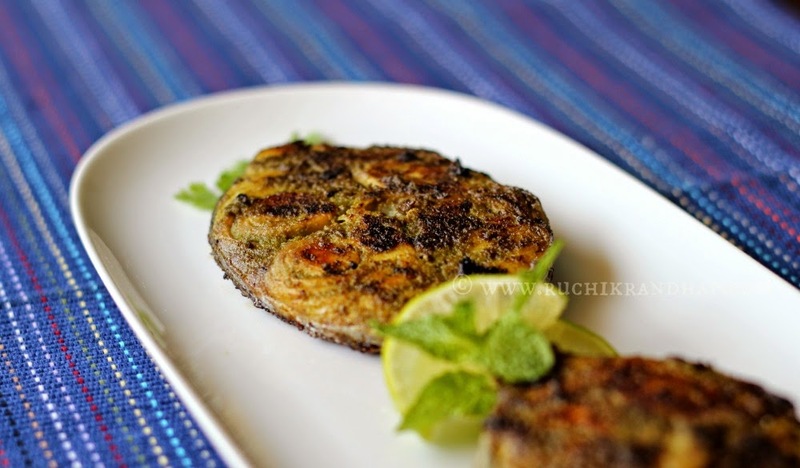 I decided that enough was enough, it was time to beckon the Mangalorean in him and I started off making just seafood at home. Mostly seafood. 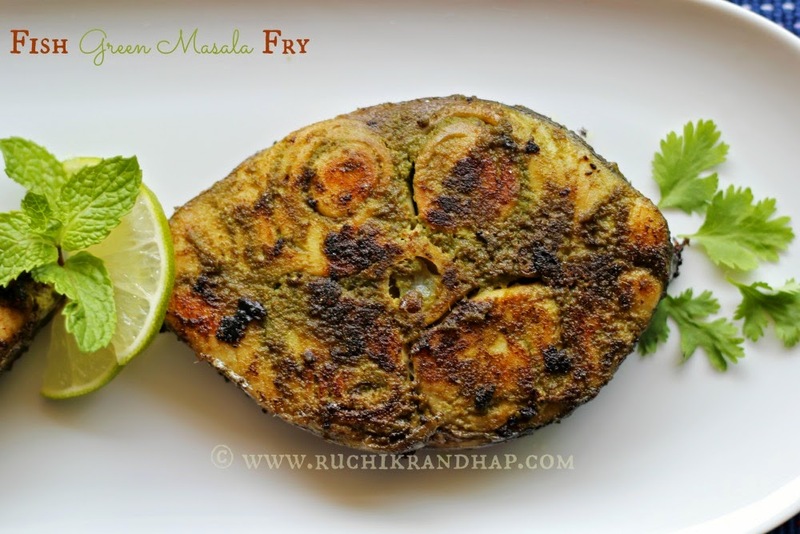 I decided to spin a tale and convince my son that perhaps he did not like the red chilli marination for fish and that he should give the green masala a try. Reluctantly he agreed. Alleluiah! I quickly set to work and the marinade which I have been working on since the past few months was put together in a jiffy. To my surprise the fried fish was well received. It has since then become a favourite at home. Although it involves grinding of the green masala it is something you can make ahead of time and freeze it if you like. Hope you enjoy it as much as we did! 1. Clean the fish in plenty of water and a little salt. Refresh in fresh water and place on a colander to drain off excess water. 2. Wash the coriander and mint well and shake off all excess water or pat dry with a kitchen tissue. 3. Grind all the ingredients mentioned under ‘For the marinade’ without using any water. If you must, add just 2-3 teaspoons of water just to help grind the mixture. If you add too much water the marinade won’t be thick and will turn watery. 4. Marinate the fish and keep aside at least for 30-45 minutes. 5. Heat oil a frying pan and fry the fish on a medium heat till it is fried on both sides. Tilt the pan slightly to drain off excess oil, then carefully remove onto a serving plate. 6. Garnish with coriander, mint, onion rings, lime wedges/slices or sliced tomatoes or just sprinkle with lime juice before serving. It goes very well with simple steamed rice and dal. Add the mint only if you don’t mind the aroma and flavour of mint. Wow good he went back to fish 🙂 that looks really good will try soon. 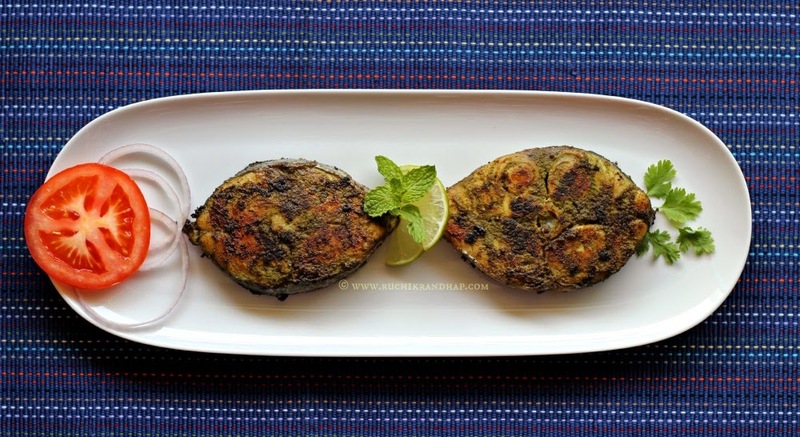 Yummy recipe shireen, I tried it with basa and it was delicious.